The Church of the Flying Starman - The almighty Holy Starman flies above us in his eternal journey upon his holy chariot of red. Starman and his Tesla Roadster will complete their first full orbit later in 2019. In any case, even without having completed a full lap of the sun, the Roadster has definitely exceeded the distance record for any car in history. There are currently about 65 million kilometers of roadway in the world, and that number grows every year. Even still, Irv Gordon’s Volvo P1800 only logged a little under 5 million kilometers before he passed, and that’s the highest mileage car we’ve ever heard of. Starman is somewhere just beyond the orbit of Mars, about 226,563,000 miles from Earth in an elliptical orbit around the Sun, which it is racing towards at nearly 10,000 mph, according to whereisroadster.com which tracks Starman’s location. Head on over if you’re a pizza fan! Its orbit will bring it close to Mars – and to Earth – in two years‘ time, with it being at its closest to Earth at 51.7m km (32m miles) on 6 November 2020. Tesla Hot Wheels Is Now Out! You can find them for sure on ebay. Start Searching. Eli Burton is the President and Founder of My Tesla Adventure, a California-based Tesla Owners Club. The club’s mission is to bring together Tesla owners to embark on fun adventures, make great memories, and form lasting friendships. Eli is also a long-time space enthusiast, amateur rocket maker, SpaceX fan, and creator of an exciting new comic book series, The Adventures of Starman. SpaceX’s Starman and cherry red Tesla Roadster have traveled beyond Mars. SpaceX shared a diagram of the car once driven by the aerospace manufacturer’s CEO Elon Musk indicating it has now reached beyond the Red Planet. Let us know if you see where to buy one! 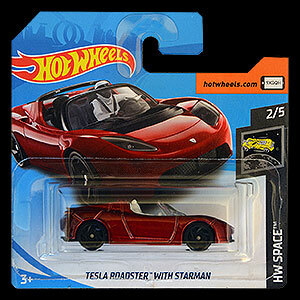 Hot Wheels launched an updated version of their ’08 Tesla Roadster miniature toy. This newest version is based off Elon Musk’s personal Roadster that was launched into space earlier this year by SpaceX. Adhered to the Roadster’s dashboard was the original 1:64 Hot Wheels Tesla Roadster. Good cross promotion on the part of Tesla, SpaceX and Hot Wheels! The newest version is available with updated packaging and paint color to match Elon’s Roadster. Sadly, there is no 1:64 “Starman” in the drivers seat. Nor is the model strapped to a 1:64 scale model of the falcon heavy. Most distressing, there is not a 1:4096 miniature of the 1:64 miniature Roadster on the dash. The game was created by the folks over at AutoWise, and you can play it over on their website. It’s titled Starman – which is what Tesla called the project as a homage to David Bowie’s classic song.